Conventional and effective method for resolving water leakage issues. 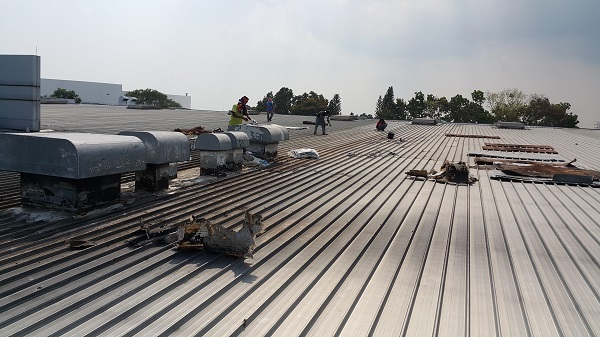 This involves treatment and prevention such as removal of previous protective materials and reapplication of new waterproofing materials. In this system, existing protective materials such as tiles and cement screed will be removed to expose existing water proofing materials. This is to ensure that the root cause or causes of leaks are revealed and rectified. After the issue is resolved, new waterproofing will be laid according to the situation on site. This is followed by *water pond testing overnight or in accordance to the specific requirements of the client. Tiles and cement screed will be laid and their original condition restored after confirmation of no further evidence of water leakage. * Subject to site conditions. A non-hacking method applied to existing floors/walls for treating water leakages.An easy to maintain effective way to prevent ingression of water, designed to minimize impact upon existing structure. Existing defective waterproofing materials will be cleared to expose existing finishing surfaces. Identified weak points will be strengthened before applying the CSE Surface Waterproofing System. Able to withstand foot traffic and long term exposure to UV radiation. We also have chemical proof and heavy duty traffic exposed waterproofing systems. This is a water leakage treatment method minus hacking/disruption to the source ofwater leakage by sealing the water path around the affected area. Also known as PU Grouting, or PU Injection. * 13 mm width holes are drilled at the area where water leakages occur for the purpose of installing packers (points) along the way with a diameter of +-6″ to each other. These serve as a medium (wall plug)for the pressure pump to be directed at the area where water leakage occurs. Then, the expanding chemical is forced into the leakage area and made to travel to its source with a very high pressure pump. Within an hour, chemical reaction occurs resulting in an expansion rate of 40 – 50 times to completely block and seal the water passage. Existing paint coating will be cleared. Followed by waterproofing coating that blocks out water molecules and at the same time allow air molecules to pass through. When extraordinary conditions are involved such as structure loading, special usage or when aesthetic appearances are taken into account. When you are concerned that traditional methods of waterproofing may not be suitable, contact us. We can devise a water leakage prevention system tailored to your specific needs. CSE believes in minimizing inconvenience during operations and wrong methods of rectification. 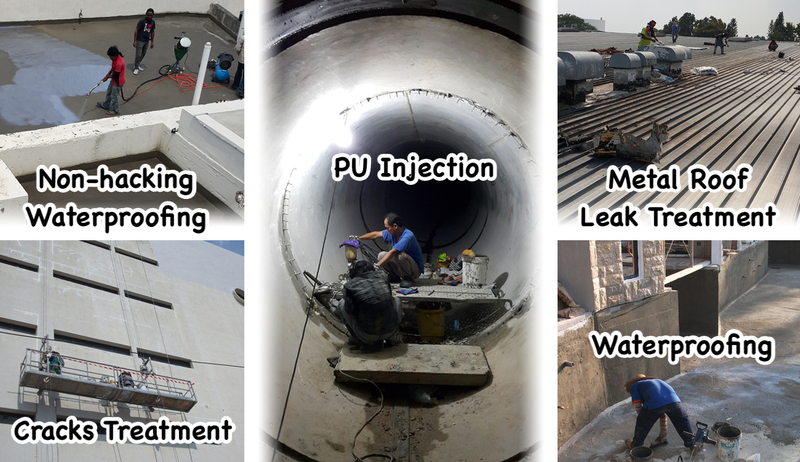 Site inspections are carried out to gather information on water leakage conditions or initiate necessary testing methods to narrow down sources of leakage so that we can address the source and then effectively repair the leakage from its root cause. service provider to accurately identify and repair the leakage with minimal damage or disruption to your property. Using sophisticated, waterproof and high resolution video technology that travels through drain pipes ranging from 75mm to 150mm in diameter. With real time video, causes of blockages such as misalignment, root penetration and others can be seen so that your contractor can get to the bottom of the issue and fix it without guesswork. Using motorized drain cleaning technology to blast a stream of high pressure water brought a nozzle at the end of a line that snake down into a drain. It scald the interior of the drain pipe ranging 32mm to 150mm in diameter, breaking through the thickness clogs and removing all types of debris and build-up without damaging the pipes. – Clears away hardened deposits – cement, lime, sand, rock, traces of soap etc. – Dislodges and clears away soft deposits such as grease and mud. – Excellent for clearing in slow draining conditions. – No hacking or digging. – No need for pipe replacement. – Eco-friendly and free from chemicals. – Long-lasting results that restore efficiency of pipes to 85%~98% flow capacity.